Welcome to Ireland, Queen Elizabeth! 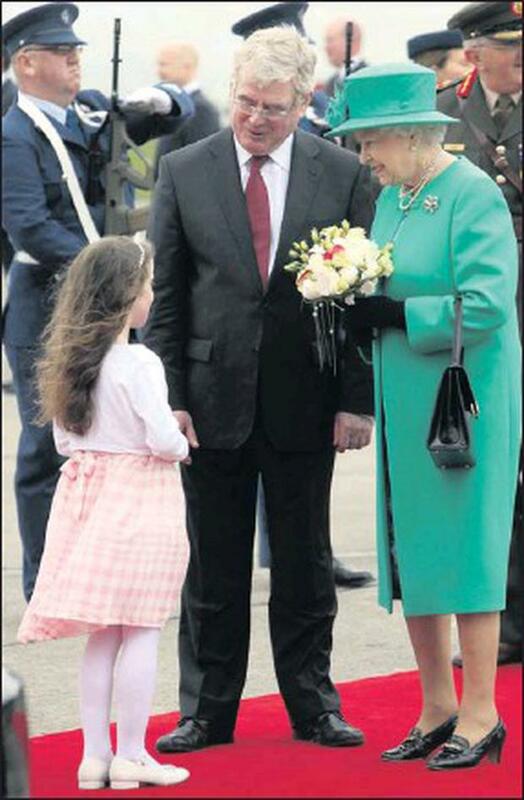 Rachel Fox from Shankill with Queen Elizabeth II and Tánaiste Eamon Gilmore. SHANKILL girl Rachel Fox was one of the first people to greet Britain's Queen Elizabeth II after her plane landed at Baldonnel yesterday. Eight-year-old Rachel presented a bouquet of flowers to the Queen after the monarch walked along a red carpet and through a guard of honour of 30 Air Corps personnel. The plane carrying Queen Elizabeth and her husband the Duke of Edinburgh touched down at the Casemont Aerodrome at 11.57 a.m. The welcoming committee included Tánaiste and Minister for Foreign Affairs Eamon Gilmore, also from Shankill, the Irish Ambassador to Britain Bobby McDonagh, the Deputy Chief of Staff Major General Dave Ashe, and the GOC of the Air Corps Brig General Paul Fry. Traffic disruption and a huge security operation has surrounded the historic visit. This is the first visit by a British monarch to Dublin since King George V came to the city in 1911.